← Best Anti-SLAPP Letter Ever! You don’t need an old-fashioned call center to have creat customer service — but you do have to communicate internally & with customers! This morning, I got a good lesson on how a business could have avoided a marketing disaster that was partly due to bad timing on marketing’s part, partly caused by a technical problem, and primarily caused by a poor customer service culture. I decided to post this, not to embarrass or even to praise the company — although they appear to have resolved my problem nicely — but simply to reinforce how connected all of the departments are with each others. I’ve mentioned before that our family includes an aspiring actor. Like most agents, his talent agent requires that the talent she represents keep updated resumes and photos on several of the online casting sites. When we first signed with the agent in September, 2012, I went to the required casting sites and posted a black and white head shot that was already almost a year old. In November, we took new photos. I sent the new photos — two head shots and a full-length photo — to each of the casting sites. The site we had a problem with was paid $15 for each of the new photos (the first one is free, you pay $15 for subsequent photos). The new photos appeared on the website in a few days, and all seemed well. Late last month, I went out to that site to add a new credit to Kameron’s resume, and noticed that the original photo was the only one on the site. I tried to upload the photos again, but there was no way to do so without paying the fee again. Next, I clicked on the “help button” and then wasted nearly a half hour trying to find a work-around for my problem. So I did what anyone would do: I took my complaint to the talent agent who wanted me to use the site in the first place. As often happens when you reach out to someone with clout in an industry, I got a phone call about 20 minutes after I spoke with our agent. The helpful customer service supervisor who called explained that they had a technical problem a few months ago and several customers had reported similar photo problems. He sent me a blank email that went directly to his personal email account, and told me to attach the photos I wanted to that message. He promised to upload the photos to my grandson’s profile promptly. He did. The company handled my problem quickly once I reached a human being, but I wondered about the comment that there was a known technical problem. I wondered if other unhappy customers had used social media to complain about the technical glitch, and if they had, why there was nothing in the company’s “help” system that explained the problem. So I went out to the company’s Facebook page, Twitter account, and LinkedIn page. Sure enough, there were a dozen or more complaints similar to mine sprinkled out over the last few weeks on social media sites. It’s possible that each of these people got the same personal phone call I did. But you certainly can’t tell that from their social media pages. In fact, the company apparently hadn’t noticed that it had a small social media crisis on its hands. It was continuing to post happy status updates about products, services, and customer successes — while its accounts racked up complaints that never seemed to draw a response from the company. To add insult to the injury caused by the technical problem, almost as soon as I had sent off the replacement photos I got an email from their sales team offering me a discount on uploading new photos. That got me riled up all over again. Despite the slight negative buzz and the unhappy customers, things could have gotten a lot worse for the company. Think about having a customer base made up entirely of film, stage, and commercial actors — not to mention casting agents, directors, and producers. People with the talent to create and post a YouTube video that could go viral in minutes. Only luck, plus the fact that it has a relatively small fan base in social media saved it. Sooner or later, every company that does business online will have a technical problem that upsets customers. Here’s how to keep a technical issue from escalating into a full-blown social media crisis. Assign someone to monitor all of the company’s social media accounts daily, and respond publicly to every single complaint within 24 hours of the time it’s posted. (This is a small company; if it were a larger one, I’d expect faster response times.) No matter how it’s handled in private, or how happy the person is when the problem is solved, it’s important that others know that it’s handled. Link customer service tickets to my opt-in email database, so that customers who have outstanding complaints with customer service don’t get marketing emails for new services. Prepare a simple Q&A whenever there is a technical issue that affects customers. So as soon as I clicked on the help button and said that I had a problem with photos uploading or billing for photo services, I should have seen a link explaining the “vanishing photo” problem, along with instructions on how to resolve the issue. Technical problems and customer service issues happen in any business. But they don’t have to affect marketing if you pay attention. Why waste money sending out marketing messages in the middle of a known customer service or technical crisis? It’s 2013…why is it so hard to find a business where departments actually communicate with each other instead of operating as if they live on different continents? 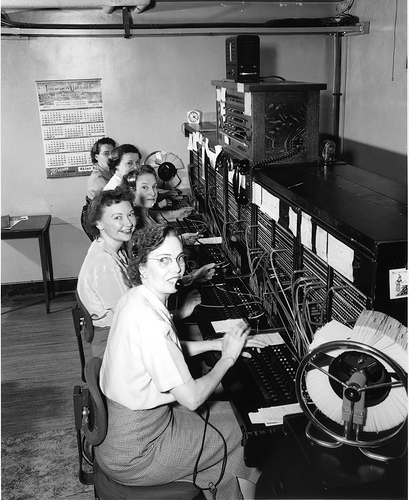 Photo credit: The Seattle Municipal Archives made this photo of city customer service operators (circa 1952) available under a Creative Commons License on Flickr. Gallery | This entry was posted in Management & Entrepreneurship, Public Relations, Social Media and tagged customer service, denial of service attacks, how to handle technical problems that affect customer service, PR, public relations, technical problem. Bookmark the permalink. I read your new stuff on a regular basis. Your writing style is witty, keep it up!